Here are the 10 things I wish I’d known before my family's sabbatical at Oxford. This is actually the fifth time I’ve lived in the UK, as my husband is English. Henry teaches at Bowdoin College in Maine USA. He had 2 Oxford University fellowships: The Nissan Institute and The Reuters Institute. He is writing a book on public television in the UK, USA and Japan. I used the sabbatical to research a young adult novel, NOT CRICKET (renamed A MATCH FOR EVE), about an American girl in England. It all started with Uprooting to England. Click on Oxford Sabbatical Index to view the whole year. I’ll post once more from Oxford next week, and then I will continue blogging in Maine. 1. How long should we go? Last time my family moved to England it was for 6 months in London, and this time we came for 11 months in Oxford. I’d definitely recommend coming for the whole year if you can. It will be easier to rent out your house back home and to find accommodation abroad. It will be less disruptive to your children’s education. Most importantly, you will make more friends. People will make more effort getting to know you and you’ll make more effort too if you’re there longer. On the 6 month stay, I felt as soon as we were settled, it was time to go back home. The move itself is very disruptive. It’s worse than a permanent move because you will have to maintain 2 households. During the year, you may have tenant or property issues to deal with back home complicated by time zones. The disruption was the biggest downside of a sabbatical. Read more about timing in the school section below. 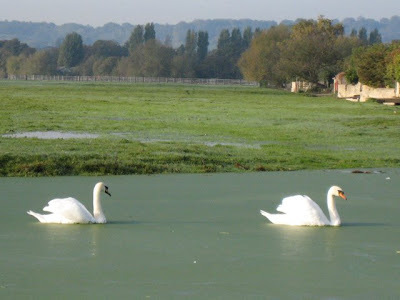 Swans on Wolvercote Common: I counted over 40 on my last walk in adjacent Port Meadow. I'll be posting cygnet photos next week. 2. How do we find a place to live? The best site is sabbaticalhomes.com. It’s set up for the academic community for home exchanges and short-term rentals. It might even help you find a tenant for your house back home. Of course I heard about it after I was living in Oxford. We found our perfect Wolvercote house through the Oxford University Gazette in March. Most listings go up in June/July. If you are connected with a university or living near one, check their paper for listings. It’s usually nicer living in someone’s home than in a professionally set up rental, and the price might be lower too. Jericho townhouses are convenient to the Oxford City Center. 3. Where’s the best place to live in Oxford? If you have a family, I’d recommend Summertown as there are good shops in walking distance; the city center is in easy biking distance, and it’s well served by the bus lines. Your elementary school child is most likely to be placed at Cutteslowe which is close by. There’s a community sports center with an okay lap pool. There’s also a private but expensive sports club, Esporta. 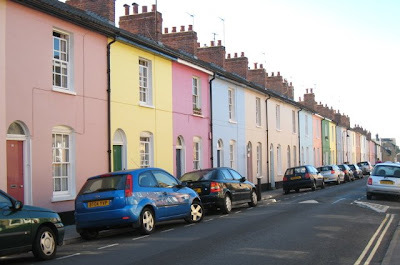 On street parking is tight, but you won’t need a car in Summertown. Buy a "second hand" bike. Summertown Cycles has some, but it’s hard to find used ones for kids. Oxford is a biking town with bike lanes going into the center. However, there are no bus routes or bike lanes going across Oxford, so pay careful attention to your location. The downside would be no great pubs in Summertown, and it’s not especially scenic. Another option is Jericho which is more charming and right by the city center. There are restaurants and some shops. It’s by the Oxford Canal, nice for a walk. It would be a good choice for a couple without kids or dog. We chose to live in Wolvercote, a small village in the northern edge of Oxford. Wolvercote is the place to live if you have a dog, and it’s a green community with lots of families. We had on-street parking for our (used) car, and the #6 bus goes every 15 minutes to the center and only takes 15 minutes. I loved our location. The downside about Wolvercote was that 3 miles was kind of far to bike into the center, and the local Wolvercote School was full. We were stuck walking our 10-year-old daughter 3 miles round trip to get her to school. My husband took the morning shift, and I the afternoon, but on some days I had to do both and walk 6 miles. I got very fit! It’s the European way to get exercise just getting places as opposed to driving in a car to work out. One more cost to include in your calculations is you'll have to pay the council tax (ie poll tax) even if you aren't a Brit. We paid £1,400 for the year! Good news is you're also entitled, as a resident, to the National Health Service. Register when you arrive. We were happy with the Jericho Health Center. You don't have to go to the closest practice. Be sure to choose one that is open full hours. 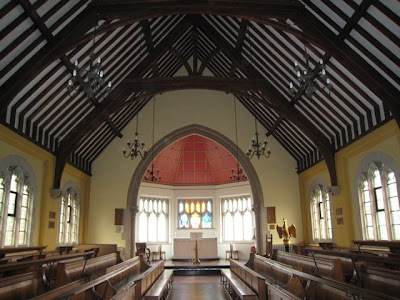 Abingdon School Chapel: the boys attend weekly Anglican services. Both state and public schools study multi-religions as a required subject. 4. Where should the kids go to school? This may be your biggest headache. English state schools (ie public schools in American) will not automatically accept your kids, and most have crowding issues. Class sizes are large – up to 30 in a class and often one more. Oxford requires a signed tenant agreement (lease.) They have to provide children a spot only if you are resident for six months. Due to school choice, you are not guaranteed a spot in a local school, and your kids won’t necessarily end up at the same schools. There are no school buses so you are responsible for your kid’s transportation unless it is over 3 miles one way (Oxford.) The school system is riddled with inequity. In London we weren’t even allowed to apply until we were physically resident. Since we were moving in the middle of the year and wanted them at the same elementary school, we sent our kids (then 6 and 9) to a prep school instead. A prep school is a private primary school, usually up to age 11 or 13. Many Americans in London send their kids to The American School. When we lived in London, we sent our kids to The Abercorn School which was mostly English but had a lot of international students with many Americans. It had an English curriculum and high academic standards. I’ve heard good things about The American School, and it certainly makes for an easier transition on both sides. Still, we were happy to send our kids to an English school for the full experience. Abercorn also cost less than The American School. It’s confusing: many private secondary schools are called "public schools" in the UK. Some public schools provide scholarships but many require an entrance exam the spring before you go. When we were told that Cherwell, the state school in Oxford, was too full to accept our thirteen-year-old son, we sent him to The Abingdon School. You can read more about it in Public School Dayboy. It's his last day of school today. Our daughter's state school runs until July 23rd! There are more vacations over the school year. Another factor you should consider is the age of your children. The demands on young children are much higher in the UK. A six-year-old is expected to be reading chapter books and memorizing times tables. Americans do catch up in the later elementary school years. Academically the differences increase as English schools get very specialized and tracked in the final years. It would be much easier for your high school student to attend The American School or an international school than to study for English A-levels that are in only a few chosen subjects. My husband in his Oriel College boating club blazer. 5. What should we ship vs. buy? Everything is cheaper in the US, so it’s worth anticipating your needs and shipping stuff over. This year things cost the same number of dollars as pounds so life was twice as expensive. Plus my husband's grants were in dollars. If you want to price compare items between the US and UK, check Argos on line. There’s a branch in Oxford center and others all over England. It’s a discount chain where you order from an in-store catalogue or on line. There are other "superstores" outside Oxford, but you won’t find the bargains or selection that you’re used to in the US. Boswells in Oxford Center will provide most of your household needs. You can find and get rid of stuff for free through freecycle. The climate, no matter what time of year, is pretty consistent. Pack for 50’s and light rain. It can get up to the 70’s (rarely 80’s) in the summer, and it might occasionally snow or frost in winter. You’ll need wellies (rubber boots) for country walks, but you can find them here for not too much. I’d recommend bringing a good, light weight raincoat or you can buy a “pack a mac” here. 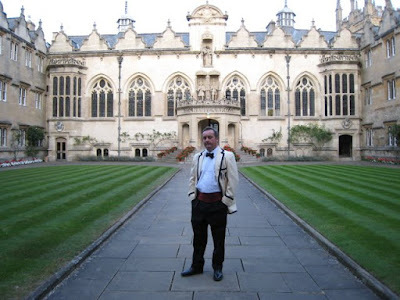 At Oxford there are many black tie or jacket and tie events. A dark suit is fine for all events for men (no real need for the tux.) You will get invited to more things at the beginning and end of the academic year than in the middle. Sensible dress shoes for women are a must as you will be walking on cobblestones and up slippery stone steps, possibly even on rooftops! Shipping home is a headache. The Royal Mail no longer ships by boat and is expensive by air. The cheapest convenient option was Mail Boxes Etc, which has a branch in Summertown and many all over the USA. It’s about £3 per kg with a 17% fuel surcharge. Shipping from the US is much cheaper. The airing cupboard can be in the bathroom, hall or kitchen. Our drying space is unusually small since the tank is extra big. 6. What’s different in the household? Your flat (as apartments are called in England) will probably have no dryer or an all in one unit that will not do much more than steam your clothes. You might have a clothesline, but it rains more days than not. Most people hang clothes on radiators or off furniture. Damp clothes are put in the airing cupboard. 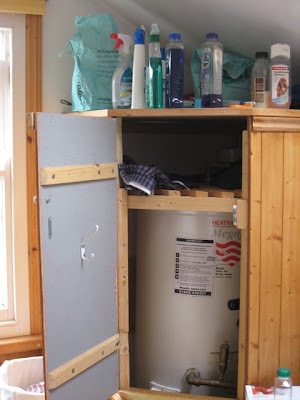 This is a cupboard around your hot water heater with wooden slats designed for drying clothes. Another option, if you have space, is to buy a condenser dryer for about £200. Every 3 loads or so you empty out the water collected in the tank. It takes longer than a vented dryer, but it does the job. I like Ariel Biological detergent. Buy Calgon limescale protection tablets to soften up the water. Then you can use half the recommended detergent. The washing machines tend to work well at spinning off excess water so clothes dry faster but also wear out faster. Due to hard water, you have to add a special salt to your dishwasher occasionally. You’ll see limescale in the machine and on your glasses if you don’t. Be sure to get a toilet cleaner that’s tough on limescale. Andrex toilet paper is softest. Your fridge and freezer will probably be small by American standards. You can order groceries on the internet and have them delivered for free (if you spend over £50) from Sainsbury's. None of your recipes will work in the UK without conversion. All English products are in grams of weight whereas American recipes are by oz volume. You won’t find American shortening for baking. Use caster sugar for baking and a little less butter than you would usually since the butter is creamier. Baking soda is called bicarbonate of soda and most Brits don’t use it. Your heat and hot water will probably be on a timer. You can reprogram it, but you probably won’t need heat at night as it rarely gets below freezing. Expect a small hot water tank and not much water pressure unless you are lucky (we were.) Most English people prefer baths and have nice deep and long ones. English homes tend to be cool and damp so bring layers to wear inside. 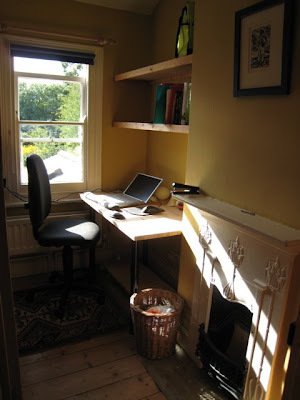 My English home office where I started writing NOT CRICKET (A MATCH FOR EVE). 7. How do I set up a home office and stay connected? The good news is there are Staples in England, including one in Oxford center, but the bad news is that everything costs twice as much. Worst of all, standard computer paper is a slightly different size – a bit longer and narrower. Shipping a large document, like a novel manuscript, is expensive. I needed to send manuscripts to readers and my agent in the USA. There were postal strikes going on last fall. We chose BT for a cable wireless hub, but it is slower than what we had back home and has to be reset weekly to discharge static electricity. It comes with a broadband phone which allows us to make inexpensive calls at any time to the USA. The reception is not as good as our land line. A cheaper option is Skype, but the reception is poor and requires a camera in both computers to get the full service. It took BT several weeks to get us connected to the internet, and my husband spent many hours (not exaggerating) on phone queues (on hold) and was often disconnected. The UK is not a service economy. Call lines are understaffed and often out-sourced. This drove us completely crazy and ruined the first couple of weeks. Does anyone know a better option than BT? If so, please comment. Free WiFi is hard to find. There are a few places where you can pay 70p for a half an hour to use ancient computers. Read my first Oxford post. Mobile phones are inexpensive and plentiful. Best to get a pay as you go with a cheap US calls plan. We did ours through carphone warehouse. You can buy a separate card to use in the rest of Europe. Blogging is a great way to stay in touch with family and friends and to create a record of your adventure. If you want privacy, you can have your blog password protected and unlisted. You can set up a free google blog in minutes. The downside of blogging was that it will distract you from work (that’s why I only post weekly) and your friends and family probably won’t post comments on your blog. They get your news without you getting theirs so you’ll feel disconnected. It’s still the best way to update people without repeating yourself endlessly. 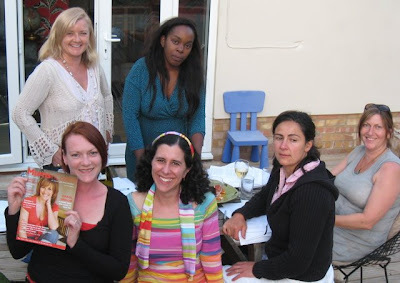 My writers' group: standing L and R Miranda Glover and Rachel Nkere-Uwem Jackson; seated L to R Jennie Walmsley, Sarah Laurence (me), Anne Tuite-Dalton and Lucy Cavendish. Alexa Wilson is in the group too. I'm missing you guys already! Photo by Miranda's husband. 8. How do I meet people? It can be challenging to make friends in England. The country is smaller so people are used to keeping their old friends and won’t empathize as readily with your situation. The English are more reserved than Americans so don’t take a cool first reaction personally. Look for groups of people who share your interests. Your local community center or library may have classes or book groups. The church would have a choir. Choosing a local state school is a good way to meet other parents. I joined a writers' group after meeting another author at a party. Join the Oxford Newcomers’ Club. It’s mostly women but open to any spouse or partner of someone who is working/studying/on sabbatical at Oxford. Oxford is not an open university and access is very limited. Through Newcomers you will go on special tours. Some are free and others cost a few pounds. They even have a book group. If you aren’t at Oxford, check to see if the university has a similar program. Cambridge University does. Our golden retriever loved Port Meadow, so did we. Wellies required! 9. Should I bring my dog/cat/ferret? England recently introduced the pet travel scheme so you don’t have to put your pet in 6 months quarantine. You have to start the paperwork and tests six months before you depart. It’s really complicated and expensive. You also have to get a final check within 2 days of departing the US. BA is the only airline that you can ship your pet to England, but you don’t need to accompany your pet. You have to buy a huge crate to fit their requirements. The crate for my golden retriever was big enough for a Shetland pony, and her airfare was over a thousand dollars! To return, she can go on American for much less, but we have to buy a smaller crate as the minimum size crate for BA was larger than the maximum size for American Airlines. 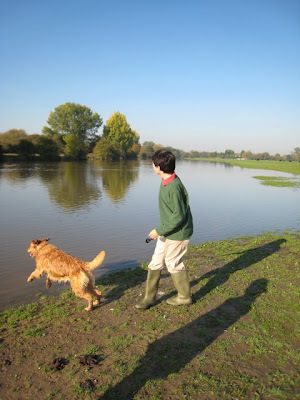 We chose to live in Wolvercote because Port Meadow is the best place to walk and swim your dog off lead (leash.) Here’s a virtual dog walk post. Hill’s Science Diet Pet Food is readily available in both countries so switch your pet over before you leave. We were very happy with our Parkwood Veterinary Group. Despite the hassle and the cost, I’m glad we brought our dog. Home is not home without her. I’ve also met people through my dog. England is very dog friendly. It’s easier to find a rental open to pets here than in the US. Dogs are welcome on Oxford buses. There are even special dog gates on country walks. Having a dog in London, however, would be difficult. 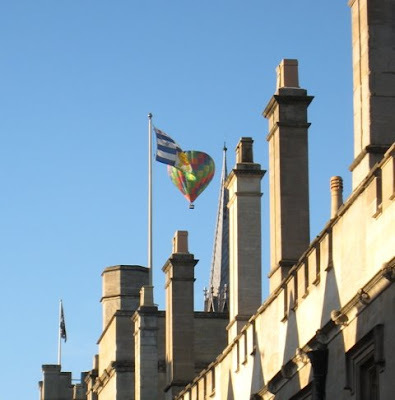 Hot air balloon over Lincoln College, Oxford. Bon voyage! 10. Was it worth it? Yes! We had a wonderful time, and I collected fabulous material for my novel, NOT CRICKET (A MATCH FOR EVE). Living abroad is much more satisfying and personal than traveling as a tourist or for work. If you have a family, this will be a broadening and educational experience your children will never forget. Even the hardships will pull you closer together. A sabbatical is the ultimate bonding experience. Plus it was fun! Did I leave anything out? Please "comment" below. Go to Oxford Sabbatical Index to view the whole year. You will be back and settled in before you know it. What interesting thoughts on your almost year. Yes, you were right to take the dog. I had a friend who bought a little house in Jericho in the 1960's when it was almost a slum. A friend taught at the American School in London. It was pretty good. hope to catch up with you when you are back in the US. Yes, one does manage to spend too much time blogging - but it's fun. Wow, it's amazing all the details that go into moving for a year. But I agree, the longer timeframe would be better. When I had to travel abroad it was always 3-4 weeks there, a month home, then back again. It was hard to maintain a life either place. Travel like that is for the young and single :) Enjoy your remaining time before coming home. Elizabeth, lucky friend for holding onto that Jericho home. It’s a fun neighborhood but getting very pricey. It will be nice to be back on the same time zone with friends back home although I’ll now have the same problem with my English friends. Blogs are great for that. Cindy, how exhausting! I can’t imagine moving so much for work. It must be such a contrast to your life now with baby. I am trying to make the most of these last days, but already there is a stack of empty boxes waiting. Hey! A year is better than 6 months, but I can see why the State department does 2 years: you spend the first 6-12 months figuring out how it all works, and who everyone is; then you could spend the next 12 months enjoying it all, and really making friends. We miss everyone already! It was an amazing year, even the hard bits. I can't believe that you are leaving and I feel like I've just met you! That was a really useful and informative piece and I'm sure that newcomers will be very appreciative. Ruth, I don’t know. I think it would be even harder to leave after 2 years with roots firmly established. It’s still not the same without you guys here. I keep wanting to click on John’s Voxford blog like a phantom limb or to call you up for lunch. Audrey, it is too sad! If only I’d met Bee, Plane and you months earlier. I wish I could come to Bee’s 4th of July bash, but my parents are visiting from NYC. It is lovely to see them, and even the sun is shining in a bright blue sky at 9pm. It is going to be very hard to leave. Rest assured I will keep blogging – it appears to be a commitment for life. Hence the boring blog title. Where I go, the blog shall follow. You must write about marrying a Brit and settling in England. When Henry and I got engaged, I thought that would be my fate too, but now he’s an American academic. I suspect England shall always feature in our future. Anyway, I won’t really be leaving but returning in my imagination to write my next novel. Wow! It's so much easier living abroad as a single teen as I did. There's just so much more to think about with the kiddos, but I'd still like to do it someday. I loved getting the tips. A big welcome home from New England! We're here for three years and our daughter is in an American school. The only thing I would add is if your children's school offers an orientation for parents, be sure to go. We recived such good information and tips (some of which I should have paid closer attention to...). Good luck packing. I am sure you will be happy to be home. PS It is really worth it to bring the dog. Ours flew on Continental! Too bad we couldn't get miles for her flight. Alyson, children do make life more complicated and more rewarding. I’ve learned a lot life in England just from hearing their school stories. There’s such a contrast between the diverse state school and the intense public school. The children integrated much faster than adults. You’ve had a lot upheaval in your life recently, but one day you should come back to England. JAPRA, I’m still happy we’ve “met” even if the timing could have better. Bloggers are at least easy to track through life. Thanks for those extra tips too. The Abercorn School in London had a really helpful evening about re-adjusting your kids to life back in America. It’s not always easy to just pick up where you left off, especially if you’re going from a diverse, cosmopolitan city to a homogenous suburb. After being away, you have changed, but home has stayed the same. It can be a good idea for the kids to switch schools rather than go back, especially if there is a more urban and diverse option for education. I needed this post about six months ago. I think you covered everything. We made it home from Oxford safe and sound on Sunday night, and we miss your family very much. Hope all goes well in your next few weeks. P.S. All the luggage made it through. Your scale was spot on. This was an incredibly thorough overview of the process! 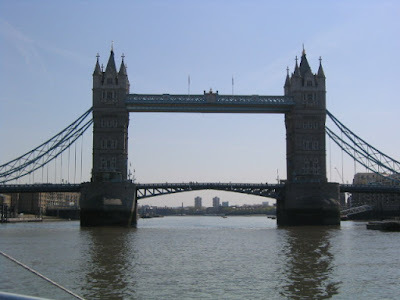 I've lived in England 7 years in total, and I still gleaned some good stuff from this post. Sarah, we will miss you here . . . but I'm so delighted to learn more about Maine and your "main" life. Deb, we’ve been missing you and your family too. My daughter tracked every hour of your flight in real time, wondering if you were home on her way to school the next morning. What a long journey to Texas! Good to hear that you and luggage made it back safely. Bee, good to hear this post was helpful. I learned some new things myself researching it. I’ll miss you too, especially the lost opportunity to get to know you better in person. Your observations made for interesting reading, was trying to visualise as I read the post. It made me wonder again of the challenges a country different from your own can present. Your advice was very thorough as well as interesting to read. I got to live in Germany as an Air Force brat and still treasure the memories. Welcome back to the States! Anil, it is so much work living abroad but well worth it. The next best thing is reading blogs like yours. W2W, there are certainly similarities between military and academic families. It does provide for an interesting childhood. That's part of the reason that my protagonist of S.A.D. is a navy wife - I can relate to her transient background and her desire to grow roots. Thanks for the warm welcome, but I still need to pack. I’ll be posting once more from England before I fly home next week. I'll keep blogging in the USA. I won't be going on any sabbaticals, but this was very interesting, nonetheless. You certainly gave a thorough overview for anyone moving abroad for some time. Hoping everything goes smoothly in your return to the States. 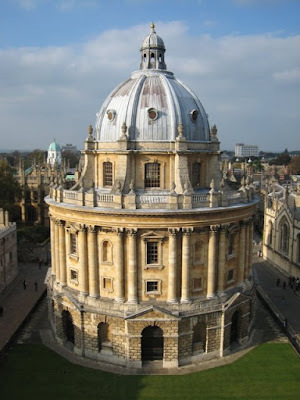 Here's the link to my last Oxford post: Oxford Highlights, favorite places and best restaurants. I'll keep blogging from Maine as I work on my Oxford novel, NOT CRICKET. Please update this post with comments as needed. Here's one more tip on BOOKS. If you just arrived, Blackwell's on Broad St is the best independent bookstore and has a big used section. The biggest public library branch is in the city center, but it was hard to get new releases. The children's section was limited. At the end of our stay, it was awful playing book triage with my collection. I shipped one box to keep and gave others away to friends, neighbors and family. The rest I took into the city center. Blackwell's buys 2nd hand books, but the used section is only open 9-1 for sales. They don't buy trade fiction or fiction hardbacks, but the public library accepts donations. I love your blog! You are so talented!! One of my sons attended Georgetown University in DC. He went to Glasgow Scotland for a semester to study his Junior year. He has wonderful pictures and stories of his travels and short-term life there (6 months), and visiting a number of his friends (via trains) who all went to different countries to study that semester. He graduated and works in DC and travels all the time now. Blaahhh.... As a mother, I worry a lot! I imagine your mother does and did that same. My sons girlfriend attended Princeton and has also written a book and works for The Library of Congress. You sound like a wonderful woman who is extremely interesting and how wonderful for your children to be able to live abroad and in the States! I know that it must be very hard for you getting them transitioned though! A mother's work is never done, never easy, but so rewarding! Glad I found your blog! I'm going to add it to my favorite blog list. You can probably tell, I'm pretty new to the blogging world, but I'm learning from each one I read! Your's has been so interesting! Thanks for writing and I'll keep reading! Kelly, welcome! It is a wonderful experience studying abroad. Your son and my children are very lucky to have had the experience. Thanks so much for your nice comments. Thank you so much for looking at my blog! It's not much, but I'm hoping to get there someday. I appreciate you looking at it! I'll keep working on it, so I hope you'll check back whenever you get a few spare minutes! Thanks again!! Hello nice blog, greeting from Belgium. Louisette, welcome to my blog! Nice golden retriever photos on your blog. I've really enjoyed reading about your time in Oxford, Sarah, and I especially thank you for this tips post. My husband is considering a year sabbatical in Oxford, and I'm both excited and very nervous about the prospect. We have twin boys about to enter kindergarten here, and the complexities of trying to enroll them in state school there is intimidating to say the least! Thank you for sharing your perspective and your writing talent! Lesley, welcome to my blog! I hope things work out for your family at Oxford. It was a very memorable year for all of us. We miss Oxford. I really liked your blog and thanks. Do you know there is free wifi locations in Oxford, England? Anonymous, thank you for the helpful link and welcome to my blog! It looks like there's more free wifi than there was 3 years ago when I lived in Oxford. Lucy, welcome to my blog and thank you! Have a wonderful time in Oxford with your family. Will you be blogging? I'd be curious to know if things have changed . I'm still polishing the novel that I was researching that year. Hi! I'm native to Oxford but moved across to the United States neatly 20 years ago. I do visit Oxford regularly though and your information is spot on! I was reading your blog to get some information about schooling for children, and about moving with dogs, as there is a possibility that we may have to move back here for family reasons! You've given me some information to start my research with! Thank you! Jasmine, I'm pleased to hear that this post is still useful. An update might include Bexit! I wish you the best of luck with your move. We loved living in England. Thank you for your article. My wife and I will be in London for six months (why didn't we decide on a year?!?) starting in January. I appreciate your tips. Good suggestions, all. One question. Did you need to get visas? I've been reading online, but it's not 100% clear. Also, did you set up a bank account or depend on transferring funds from your US accounts. I'm just starting to deal with wire transfers for the deposit on the flat and it's been quite a headache. How did you folks manage your money? Dan, I'm glad to hear that my post was helpful. Last time I checked, a tourist visa is fine for 6 months as long as you are not working. I'm married to a British citizen and our kids have dual citizenship so they didn't need visas. I had a "settlement wife" visa, which is only available to a wife of a citizen and was good for 2 years. We also have always had a joint British bank account. Contact the embassy and s financial advisor for more advice. Good luck and enjoy!